The Barnes and Noble line consisting of the Nook Tablet and Nook Color aren't exactly known for their available mapping solutions. That's because they lack the GPS hardware needed in order to function correctly but that doesn't mean there isn't any way around that. Skobbler knows that and as such, they've gone ahead and launched ForeverMap 2 for the devices. Using WiFi positioning, ForeverMap 2 will bring access to global and local digital maps, that will assist with local search, address search and category search. You'll find no turn-by-turn here but the app is free to try out, should you decide you like it, a premium version is available for $5 that opens it up for unlimited access to downloadable maps for offline use. Need to know more? The press release is below along with the download link. NEW YORK, NY (July 30, 2012)—skobbler, a leading provider of mobile map-based solutions, today announced the launch of ForeverMap 2™, a brand-new digital map app for the critically acclaimed NOOK Tablet and NOOK Color by Barnes & Noble, Inc. With a robust set of features, including intuitive route guidance, Wi-Fi positioning, as well as local and category search functionalities, ForeverMap 2 is the first-ever digital map app for NOOK, enabling users to experience and explore their surroundings like never before through their NOOK devices. 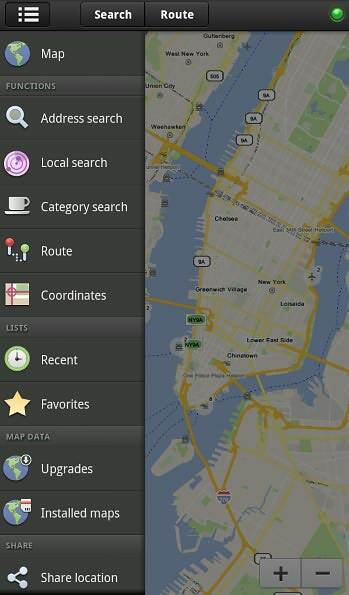 ForeverMap 2 is available for download on NOOK Apps™ for FREE. In June, skobbler announced the beta release of GeOS, a new access technology platform that allows app developers and web service providers easy, yet powerful implementation of OpenStreetMap data into their products. GeOS is a one-of-a-kind “operating system” for commercial use of OpenStreetMap, making use of the crowdsourced data intuitive, affordable and secure for developers to build services with it. Like skobbler’s suite of existing OpenStreetMap-based products, including the internationally renowned GPS Navigation 2 and the recently launched Maps by skobbler, a web-based map powered by OpenStreetMap data, ForeverMap 2 was built using GeOS technology and showcases the utility of the platform for third-party developers seeking to integrate location-based features and functionality into their products and services, as the total user base for consumer location-based services is expected to reach 1.4 billion users by 2014. * GeOS will be publicly available in Q1 of 2013. ForeverMap 2 is available for download on NOOK Apps™ for the NOOK Tablet and NOOK Color by Barnes & Noble, Inc for FREE. The premium version, ForeverMap 2 PRO, allows for unlimited access to installable maps and offline use, and is also available for download for $4.99 USD. For further information on recent developments at skobbler, please visit http://skobbler.com, http://blog.skobbler.com, http://fb.skobbler.com or http://twitter.com/skobbler. Founded in 2008, Berlin-based skobbler (www.skobbler.com) is one of the premier players in mobile location-aware services. With over 2.8 million customers on iOS alone, skobbler has regularly topped overall and category app charts in numerous countries, leading the way in way in the development of location technology and end consumer products based on the OpenStreetMap. skobbler also facilitates the development of mobile application projects for third parties through market analysis, conceptualization, specification, development, and marketing and with its GeOS software enabling solution allows companies to realistically adopt the OpenStreetMap service as an alternative to current standards. skobbler has extensive knowledge of server-based solutions with development expertise in iOS and Google Android. *According to Gartner (February, 2011), consumer location-based services are expected to reach 1.4 billion users by 2014. Barnes & Noble, Inc. (NYSE:BKS), the world's largest bookseller and a Fortune 500 company, operates 691 bookstores in 50 states. Barnes & Noble College Booksellers, LLC, a wholly-owned subsidiary of Barnes & Noble, also operates 647 college bookstores serving over 4.6 million students and faculty members at colleges and universities across the United States. Barnes & Noble conducts its online business through BN.com (www.bn.com), one of the Web's largest e-commerce sites, which also features more than two million titles in its NOOK Bookstore™ (www.bn.com/ebooks). Through Barnes & Noble’s NOOK® eReading product offering, customers can buy and read digital books and content on the widest range of platforms, including NOOK devices, partner company products, and the most popular mobile and computing devices using free NOOK software. Barnes & Noble is proud to be named a J.D. Power and Associates 2012 Customer Service Champion and is only one of 50 U.S. companies so named. Barnes & Noble.com is ranked the number one online retailer in customer satisfaction in the book, music and video category and a Top 10 online retailer overall in customer satisfaction according to ForeSee E-Retail Satisfaction Index (Spring Top 100 Edition).